Marquette Seniors Say Goodbye In Tough Loss ~ The Bucky Channel - The World of Sports from Wisconsin's Perspective. 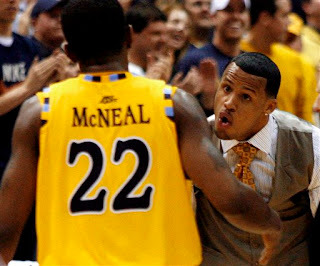 It was an emotional end to the Marquette home season as Dominic James, Wes Matthews and Jerel McNeal said good bye to home fans Saturday afternoon. The loss of the three senior guards will be tough to take and the 86-79 overtime loss to the Syracuse Orange didn't make the goodbyes any easier. The loss dropped Marquette to 23-8 (12-6) and the 5th seed in the Big East Conference heading in to conference play. It also marked their 4th straight loss. I knew the loss of Dominic James would be hard for Marquette to bounce back from, and their end of the season schedule which saw them play UConn, Louisville, Pitt, and Syracuse wouldn't make it any easier either, but I figured this team was good enough to win one, or two of those games. The one thing that is evident is that this team just isn't going to give up. They look like a team with the will to win, just not the fire power to do it. With out a serviceable/dominant big man, they needed all four of their scorers along with Lazar Hayward to put the pressure on other teams. Now that teams haven't had to worry about James, even though Acker has played relatively well considering the circumstances, teams are able to break the Marquette code. The Golden Eagles were led in scoring by Jerel McNeal who had 25 points. Lazar Hayward scored 17 and Wes Matthews had 14 points and 12 rebounds. In general it was a poor shooting day for the Geagles, as Winks calls them. From the field they shot 36% while from 3 point land they were 7-30 which puts them right around 23%. Marquette will get a first round bye in the Big East tourney and will get the winner Georgetown vs. St. Johns game. The second round game will tip off Wednesday at 6 pm on ESPN. Here is the Big East Tourney Bracket. IN OTHER NEWS: UW-Green Bay was beat by Cleveland State last night in the Horizon League semifinals 73-67. Cleveland State will go on to face Butler for the Horizon League Championship. GB did beat Butler earlier this year and I was routing for a possible 3rd team from Wisconsin to sneak into the tourney.